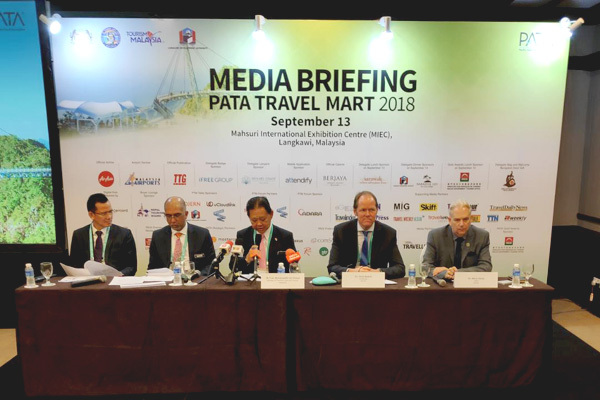 Pata Travel Mart (PTM), the Asia Pacific’s leading travel trade event, was thrown open today with more than 1,400 delegates from 70 countries attending the exhibition being held at Mahsuri International Exhibition Centre (MIEC) in Langkawi, Malaysia. “Pata Travel Mart continues to stand tall as Asia Pacific's most value-adding networking and contracting event. For over 40 years, the event’s continued success has been due to its ability to strike the right balance between quality and quantity when it comes to buyer-seller appointments. This year’s Pata Travel Mart continues that strong tradition with some strong official figures,” Pata chief executive officer Mario Hardy said in his address. The international event, which got off to a colourful start on September 12 with an inaugural dinner reception dinner at the MIEC, has registered a total of 389 sellers from 208 organisations and 33 destinations. On the buyer side, it has hosted a total of 252 buyers from 241 organisations from 53 source markets. The event ends on September 14. “A key area we are constantly working on is visa facilitation. Improved visa facilities in China and India are making it convenient for more travellers to visit Malaysia. In fact, we are seeing double-digit growth from these two markets due to the positive steps taken to facilitate their travel here, and we hope that this can be expanded to other markets,” Ketapi said. “Malaysia has also signed up to be the Official ITB Partner Country 2019. We are deeply grateful to accept this titleship as it entails publicity opportunities globally as well as the potential to reach out to key decision makers and top industry players in the region,” he added. “Moving forward, our direction for 2018-2020 is to optimise digital marketing; focus on industry collaborations; leverage on major events for publicity; also leverage on mega projects coming on board in Malaysia; integrate our marketing campaigns with other Government agencies; and promote Malaysia as a filming destination,” Ketapi added.